Alex McKown was born in 1996 and he first picked up the guitar when he was 6 years of age. When he was 8 he asked if he could have an electric guitar for Christmas. Alex quickly progressed and spent many hours playing along to guitar legends such as Eric Clapton and BB King. When Alex was 11 he started to have lessons from Samuel C Lees at Tameside Music Academy. A passion for the blues was ignited ! Alex developed his performance skills by performing regularly at the blues/rock jam at The Whittles in Oldham. "The Moon and Sixpence" in Glossop gave The Alex McKown Band their first gig in 2008. The band went down a storm and the local paper carried the headline "Guitar Prodigy is Star of the Future". When the next gig was announced the headine was "Brilliant Blues not to be Missed". Alex then started to listen to the artists appearing at the major blues festivals in the UK and met Hamilton Loomis from Texas over the internet. Hamilton kindly agreed to let Alex sit in on his UK tour in 2009 and this helped to raise his profile. In 2009 Alex performed with his own band at The Great British Rhythm and Blues Festival in Colne, Newark Blues Festival and Ramsbottom Blues Festival. In 2010 Alex opened the British Stage at Colne followed by further appearances for Boogaloo Blues and Newark Blues Festival. In 2011 Alex performed two shows at the Zinc Blues Festival in France and also appeared for the second time at the Colne Festival on the British Stage. 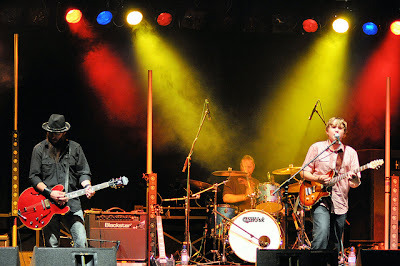 The highlight of 2011 was a nomination in the British Blues Awards and inclusion in the Best Newcomer Poll by Blues Matters Magazine. Another nomination in the 2013 British Blues Awards and a stellar line up of festival and headline gigs are scheduled.